At Matthews Roofing Company Inc., we believe that there is a proper roofing system for each individual Chicagoland building. Our philosophy is to install the best possible roof in every situation. In selecting a right roofing system for a building, we consider such factors as structural design, aesthetics, budget, and serviceability. We pride ourselves on developing a long-term working relationship with each Chicagoland building owner to make sure that the selected roof is a good fit. This is why for over 79 years; Matthews Roofing has selected some of the finest roofing systems in the world today. We provide you with exceptional focused commercial and residential roofing solutions through our expertise. A built-up roof is composed of three elements: felt, bitumen, and surfacing. The felts, which are made of glass, organic or polyester fibers, serve much the same purpose as reinforcing steel in concrete. The felts are necessary as tensile reinforcement to resist the extreme pulling forces in the roofing material. Felts installed in layer fashion also allow more bitumen to be applied to the whole system. Bitumen, either coal-tar or asphalt is the “glue” that holds the felts together. It is also the waterproofing material in the system. 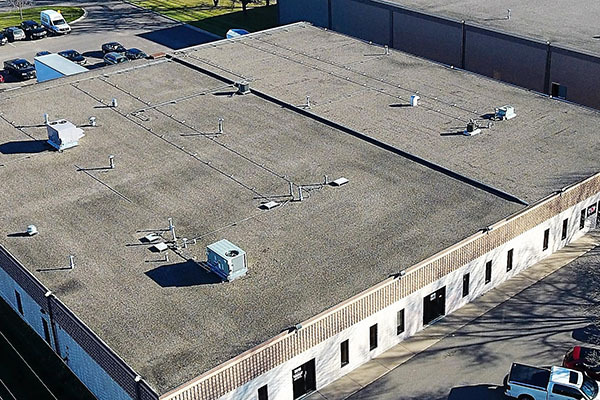 The surfacing that is normally applied to built-up roofs are smooth asphalt, gravel, slag, or a mineral-coated cap sheet, and serves as an excellent wearing surface. This technique of installation has been relatively unchanged for over 100 years.